The minus sign in "-site" is the trick to excluding a website from Google search results. This morning I found myself thinking about that perennial question of the reliability of Wikipedia. This time it is because my older daughter (she’s in junior high) is forbidden to use Wikipedia articles in papers for school, but she wasn’t given any other recommended suggestions from her teacher. So my observation is that she is now more likely to use online sources that are actually less reliable than Wikipedia. Teacher: Your bias against crowd-sourced and curated knowledge has driven your students to find non-curated “knowledge.” Grade: F.
Better idea? Teach students to evaluate the credibility of online sources, and allow them to use Wikipedia articles if they are deemed sufficiently trustworthy. Mark down the grade if untrustworthy articles are referenced. This would teach a real research skill, and be more educational than just pointing to the Google search box. But that’s a rant, and not what I learned. 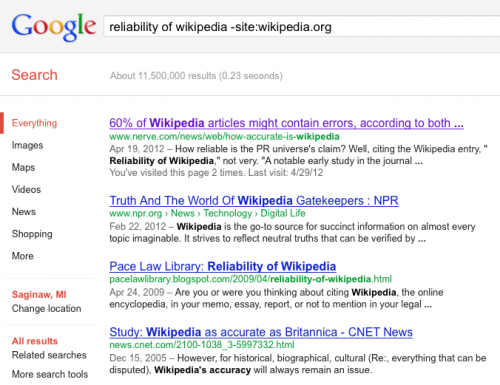 I first did a Google search for “reliability of wikipedia,” and found a whole bunch of results. But they were mostly from Wikipedia. I looked at a few interesting Wikipedia articles on the topic, but wanted to see what websites other than Wikipedia had to say about this. And there was my challenge. How do I do that same search but exclude results from wikipedia.org? Well, I already knew that you can type site:domain.com into the search field to just search a specific website, so I tried site:-wikipedia.org. That didn’t return any results. So I tried another approach that did work, putting the minus sign to the left of “site,” and it worked like a charm. There. I learned something new today. Yes, that’s right folks, this is a map of downtown Chassell, where I grew up. Okay, I didn’t actually grow up in Chassell, my parents’ house is outside of Chassell, on Paradise Road. Anyway, for those who’ve wondered how big the town is (anyone? ), here’s a street map of the place. Check out Google Maps. It’s where I pulled this image from. The interface is pretty slick. You can drag the map around, and it is quite smooth. Zooming in and out is smoother as well. It’s still in beta and won’t work in some browsers, but should work in most recent browsers (except Safari). Author Davin GranrothPosted on February 23, 2005 December 14, 2008 Categories DavinTags computing, Google, mapLeave a comment on Look! It’s Chassell. Fast Company magazine has a nice article on Google and the people and innovation behind it. One of the things that struck me about it was the recurring reference to Google’s respect for the user. Google understands that its two most important assets are the attention and trust of its users. If it takes too long to deliver results or an additional word of text on the home page is too distracting, Google risks losing people’s attention. If the search results are lousy, or if they are compromised by advertising, it risks losing people’s trust. Attention and trust are sacrosanct. Great stuff. Read the article. Author Davin GranrothPosted on March 17, 2003 Categories User experience, web, technologyTags GoogleLeave a comment on Great Google, Batman!